Sweet raspberries picked by hand at the peak of season and frozen within 24 hours. Organically grown in the heart of England by a co-operative of specialist fruit growers. Good Causes - Sales of Waitrose Duchy Organic products provide a donation to The Prince of Wales's Charitable Foundation. This year, over £2.5m will be donated to the Foundation, supporting good causes across the UK. Since 2009, you've helped to raise over £17m for initiatives such as the Duchy Future Farming Programme, which helps farmers develop more sustainable farming practices. Grown without reliance on artificial chemicals and fertilisers. 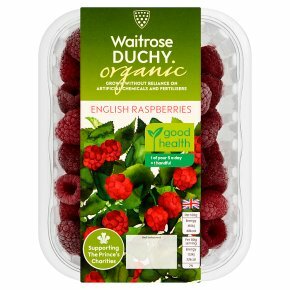 Juicy organic raspberries, grown in the heart of England by a co-operative of specialist fruit growers. Delicious with a spoonful of cream or stirred into yoghurt.